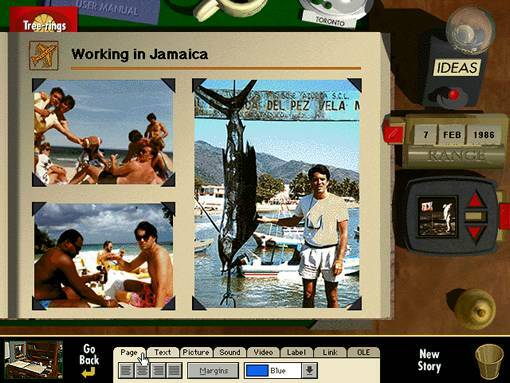 For Greg Long, inventor of the Life Log/Echo Lake idea, there was no question he wanted Mackerel to design it, but the software publisher, Delrina, needed convincing. 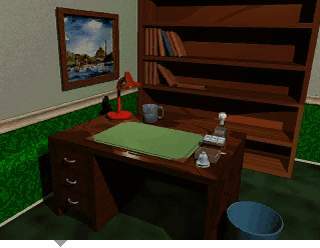 First we had to produce a simple demo -- over the weekend -- to establish the basic concept of the product design: the room, the desk, the book[s] with 3D rendered graphics. Then we needed to flesh out a bunch of the ideas and show another more extensive demo. Next we were able to finalize and document the design plans, and we rebuilt everything again from scratch. It took us right until the end of the timeline to settle on the log cabin, while we finalized every other piece of art. It was really quite comical, although Jeramy eventually stopped laughing after creating countless renderings with endless new texture maps. As he put the finishing touches on the final library artwork we wondered why it took us so long to arrive at the log cabin setting. We had to dummy up just about every idea in this extensive "demo" which was pretty close to a prototype... Here you can see the safe behind the picture (implemented in final version) and a book moved from bookshelf to to desktop. In this view you would add stories and media files to your Echo Lake books, as well as fill out lists that would help you organize your memories. No one knew what the snow globe was in most of our earlier versions (left)... one tester called it a "plate of peas." We struggled with the artwork for some time before we finally gave up on realism and turned the snowglobe on a funny angle. No one ever commented. 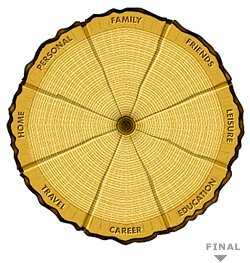 It took a while to get the right feel for the tree rings. 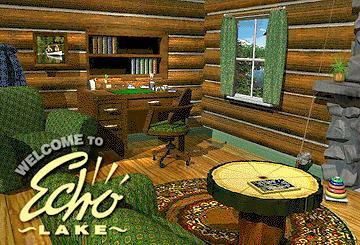 As the user added stories to their Echo Lake book, they would assign them a date and a category. The stories would then appear as red dots on the tree rings. With enough stories, it could be an interesting picture of your life. 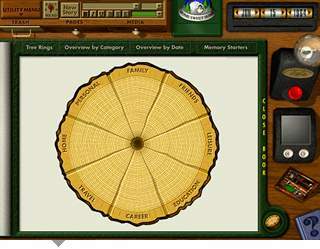 We wasted a lot of time wondering if the coders could generate tree rings dynamically and still make them look good. It was a moot point. It was not in the timeline or budget. In the final splash screen below you can see the coffee table in the foreground is actually a slice of this tree. Some of this is © 2001 Kevin Steele.